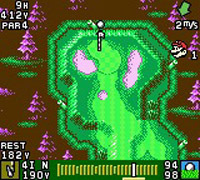 A portable golf game starring Mario. Choose from four rookie golfers as they join the Golfing Academy, ready to take on the champions. You move around the Academy freely as in an RPG, talking to people, issuing challenges and playing minigames to improve your character's golfing stats. Beat all of the Golf Masters on an 18-hole course to become champion. In the multiplayer game and minigames you can play as Mario characters. You can link the Game Boy version to the N64 version using the N64 Transfer Pak, allowing you to unlock secrets in both versions. The last golfing range is called "Links Club". 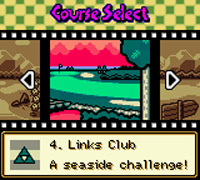 The club's logo is the Triforce from The Legend of Zelda Series.